You are at:Home»Uncategorized»Fun with Fabric and a $100 Giveaway! I am in LOVE with my new pillow! Can you be in love with a pillow because if so then I am not just in love, but smitten! 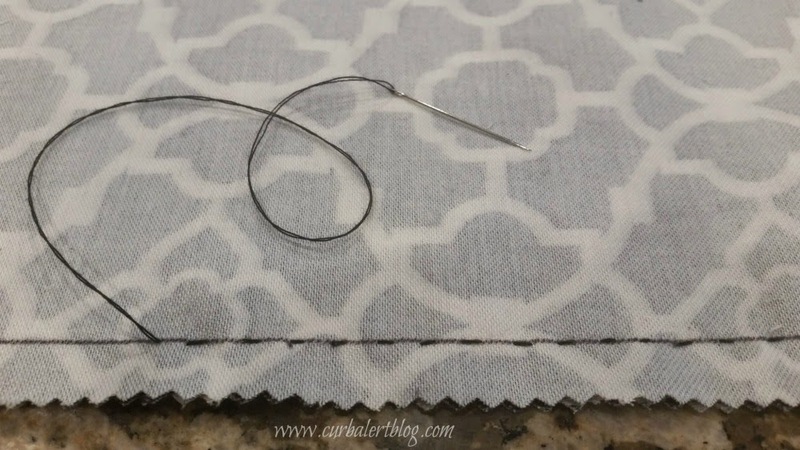 I am very excited to team up with my blogger friends and Online Fabric Store for this post. Online Fabric Store. 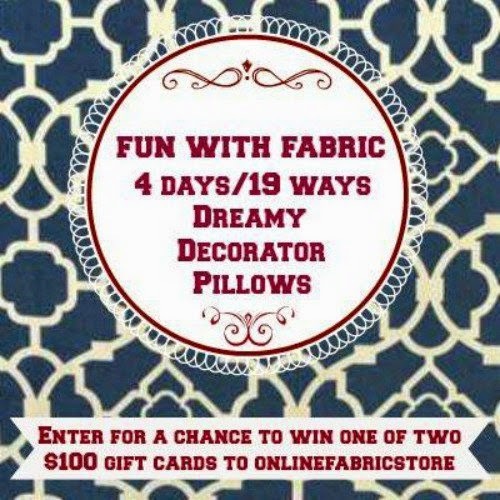 Be sure and enter at the end of this post for a chance to win one of TWO $100 gift cards to Online Fabric Store – that could be YOU! Be sure to enter the form at the bottom of this post. 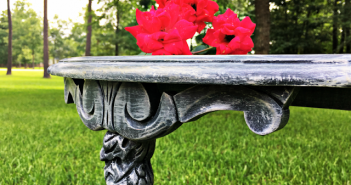 But First – Here’s what we did! 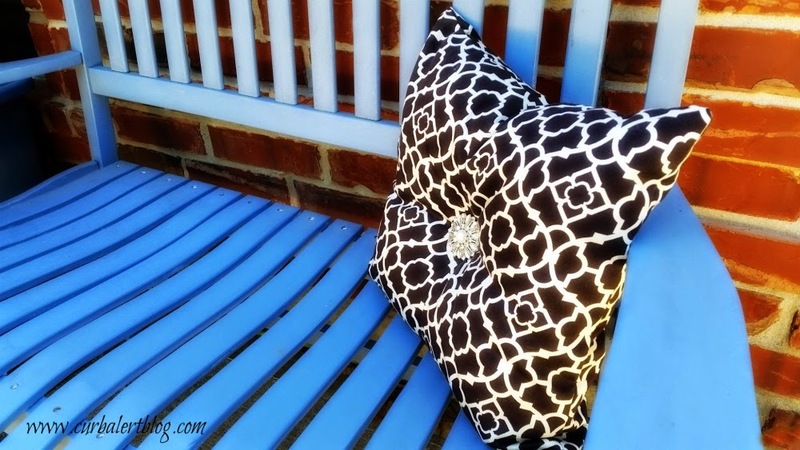 19 of us were given 1 yard of gorgeous fabric of our choice from OFS and a pillow form. 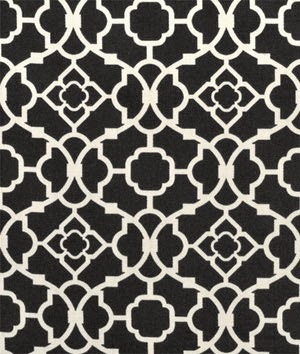 Waverly Lovely Lattice Caviar Fabric. I was super excited to get started on this but have to admit it has been a long, long time since I have sewn, so I was a little nervous. 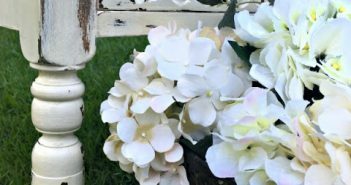 It didn’t help that my other blogger friends have been posting some amazing pillow ideas all week and have set the bar really high! I will provide the links at the bottom of this post so you can visit them as well. 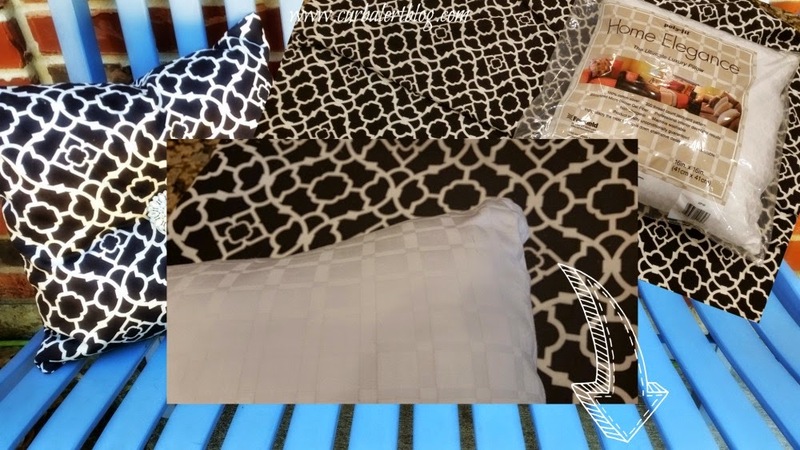 My friends have also posted some amazing pillow tutorials so I will spare you the details here and just show you the supplies that I used for mine. First let me tell you about this Online Fabric Store Home Elegance Pillow Form. It is the perfect shape and fluff for this project and in itself is made with high quality elegant fabric. Cut, measure, sew and ready to go…so I thought! Seems that my sewing machine is out of commision so I went back to the basics and sewed up my pillow by hand. My mom and middle school home-ec teacher would be proud! It literally took me thirty minutes to complete my pillow! If you don’t have the skills or the patience – no worries. In addition to carrying fabrics and supplies to make your own pillows, OFS now carries ready-made decorative throw pillows! I just may have to try a few more because can you ever have too many pillows? According to my husband, yes as he removes the 57 throw pillow from our bed but what does he know??? Like I said, thirty minutes later and I had this beautiful new pillow! The center embellishment was sewn on with some Heavy Duty Upholstry Thread. And now some beauty shots! There are so many places in my home where my new pillow looks stunning! 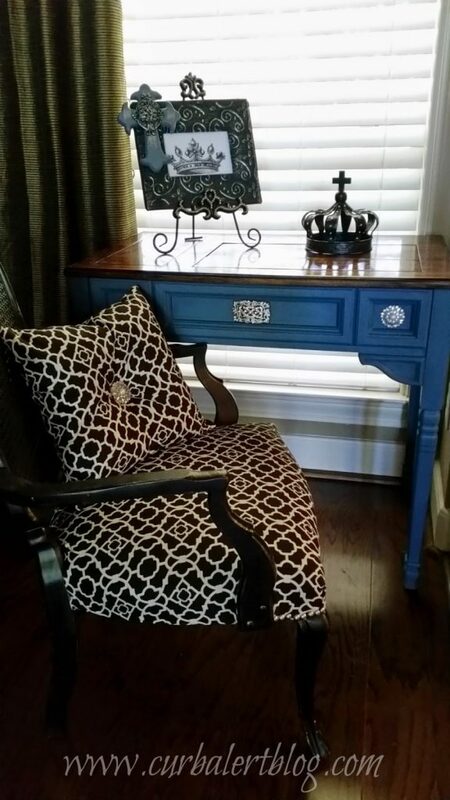 The pillow looks great with my Aubusson Blue Sewing Cabinet. 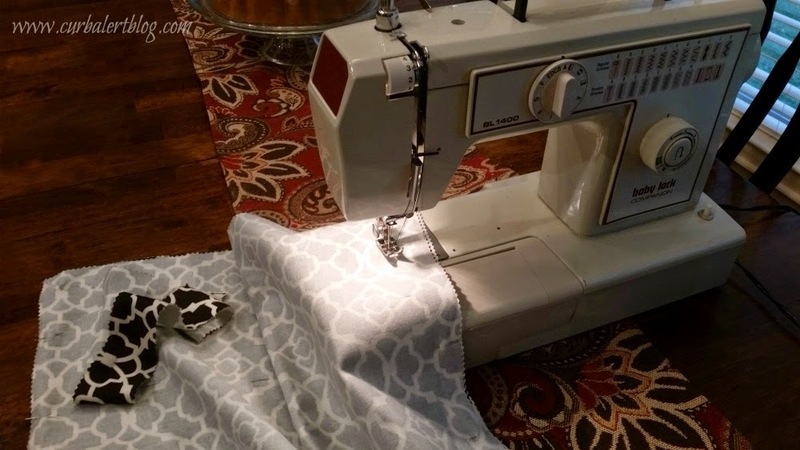 Note to self…get sewing machine fixed! 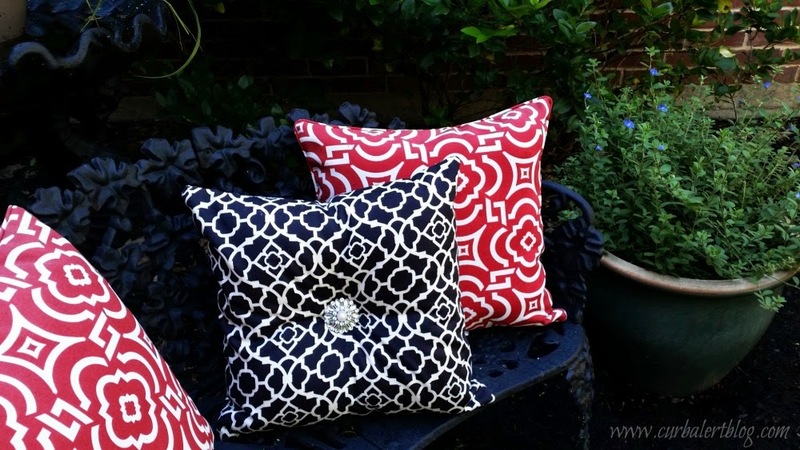 Online Fabric Store sells similar coordinating Red pre-made decorator pillows HERE. Wow! maybe I should have made a few more pillows to spread around, but did you happen to notice the chair? Online Fabric Store was so generous with the amount of fabric that I was able to do a little makover on the chair too! Now I have a comfy place to sit in my kitchen as I blog. Well I am super pleased with my pillow – THANK YOU Online Fabric Store for the opportunity to create some new beautiful home decor! Now here’s your chance to WIN! 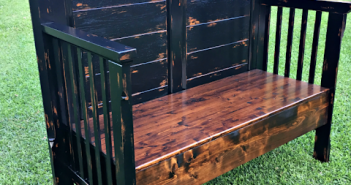 Next Article Gloomy Gray to Bright Blue Headboard Bench! Love your pillow! Great job! Wow, hard to choose. There are so many that I would love to have. I really like the Hollis Cream Geometric Decorative Pillow and think it would look lovely in my bedroom. Thanks for the great opportunity!! Your pillow looks great! Black and white are so versatile and will match everything. Very pretty! I really love the embroidered pillow. We have leather couches, so my pillows slide off if I don't sew a gripper pad on the back. As long as no one flips it over, they never know! Your pillow is stunning~ oh my goodness. 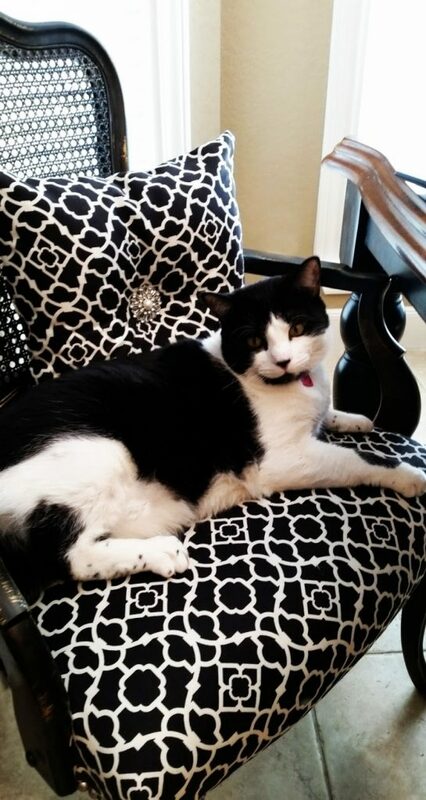 I think I need your pillow and the black chair! Love your pillow. I like The Oakbrook Multi Suzani Pillow on the Fabric site. Love the fabric you chose! Beautiful pillow, Tami! I love the added bling. So classy and creative. 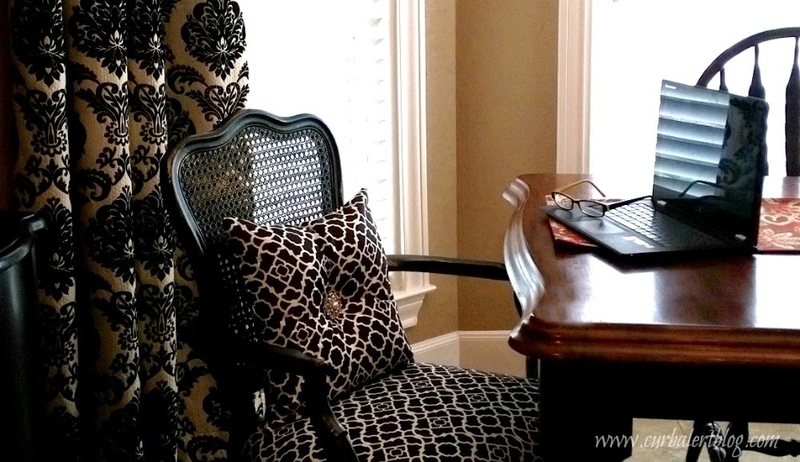 Your chair makeover is the perfect bonus! LOVE it! Wow-nice pillow would never have known you went the old school way! Actually there were several pillows I liked so I eanie meanie miney moed it and the lucky one was Livonia Golden Suzani. 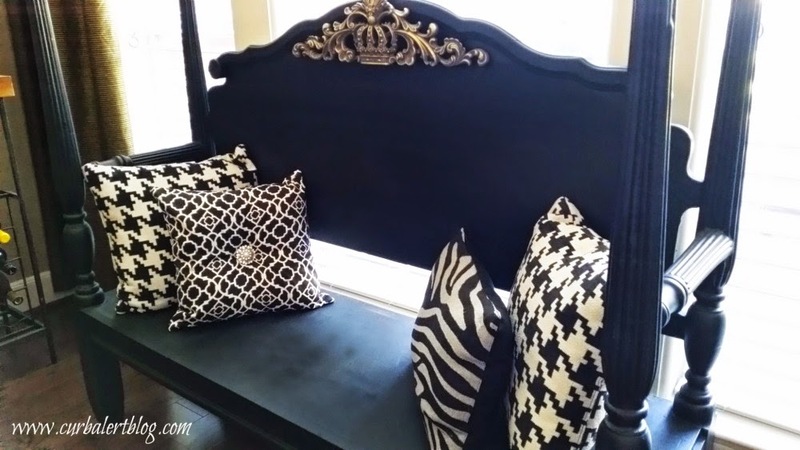 Love the fabric you chose and especially love how you added the embellishment to the center of your pillow. Love that you sewed your pillow by hand!!! That's the way I first learned to sew. Hi there! I LOVE how creative you are. Gorgeous pillow. My comment is not as much about the pillow as it is about the BEAUTIFUL curtain panels in a couple of the pictures you posted. 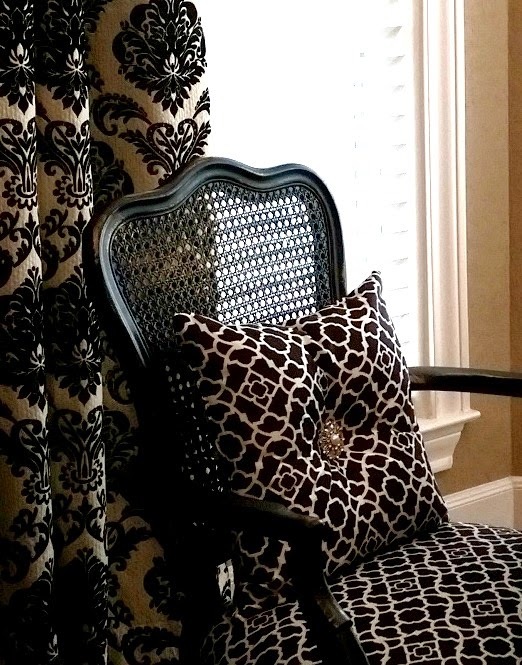 They look like some kind of black damask flocking on burlap. 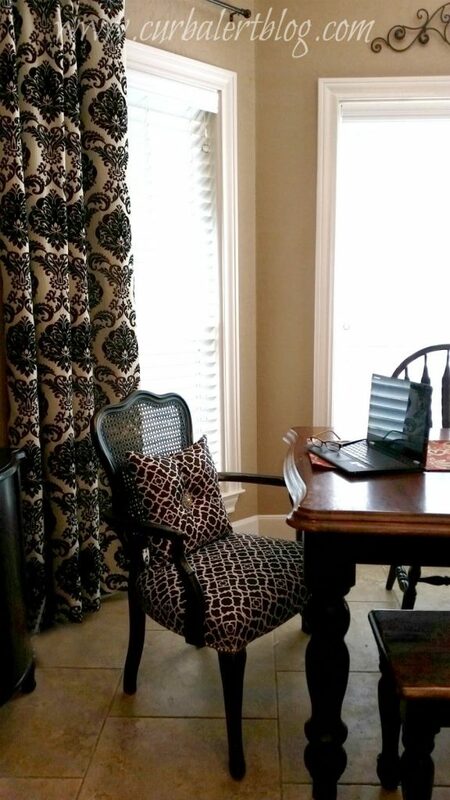 I have tried to locate fabric like that but have not been able to find any. Did you make these or purchase them? Either way, can you pretty please point me in the right direction? Thank you!